When you jump in the shower, your thoughts of water probably go no further than what pours from the showerhead. But long before you turned the water on, many more gallons were used to produce the energy needed to pipe the water into your home. Water was also most likely used to manufacture the plastic shower curtain and your towels. Most Americans think of water in terms of what they drink or use every day. They rarely consider the enormous amounts of water needed to produce energy that powers their lives. Energy and water are intrinsically connected: Without one, we cannot have the other. Energy drives the systems to pump, treat and distribute water and to produce electricity. More than 18 billion gallons of water are withdrawn each day to manufacture products, such as plastic bottles, computers, cell phones and blue jeans. Water is also essential in refining fuel to transport those goods in addition to growing the food Americans eat. Experts warn that needed water supplies are limited. Water has historically been considered a renewable resource because it cannot be destroyed as it moves through a natural cycle. But because of climate and other factors, the amount and location of rain, sleet or snow is increasingly sporadic. Consumers can no longer depend on precipitation to replenish fresh water supplies in lakes, rivers and reservoirs. “All we’ve ever had on the planet is already here; most of it is salt water,” said Tim Keim, a consultant with a reclaimed water company, Integrated Water Strategies, in Apex, N.C.
Of the Earth’s water, 97.5 percent is salt water. Of the remaining fresh water, almost 70 percent is locked in glacial ice and 30 percent in soil, leaving less than 1 percent of available fresh water for humans to use. So how are Americans withdrawing their water resources? Domestic, or what is often referred to as personal, and industrial users extract about 5 percent. The public sector, such as water treatment and delivery systems, uses 11 percent. Irrigation for agricultural and other purposes takes almost one-third. Almost 50 percent of water withdrawn goes to thermal energy production. Water is essential in many stages of energy production’s process, from cooling in nuclear reactions, generating steam to spin turbines in hydroelectric plants and condensing steam in thermal production. And it is essential to run the plants that generate electricity. The most obvious relationship between energy and water in the energy sector is hydroelectricity, where water is withdrawn from a dammed reservoir or other source, pumped through a hydro plant to drive the turbines to produce energy, and returned to an external body of water, such as a river. “For a hydro plant, electricity is needed to open and close the flood gates, run the pumps, cool the generators, run compressors, turn on lights and computers in the offices, etc.,” Scott Sutton, environmental communications specialist at Progress Energy, wrote in an email interview. Once created, a portion of the electricity is diverted to the hydro plant for its operations and the remainder sent out to customers, he said. Coal, nuclear, gas and other power plants also do the same. Progress Energy, a power company that operates 32 facilities in North Carolina, South Carolina and Florida, has four hydro plants in North Carolina totaling 225 MW, or about 1 percent of the company’s total generation capacity. When these hydro plants operate at 100 percent, they produce enough electricity to serve the needs of 146,000 average residential customers. Sutton noted that hydroelectricity is a strong complement to a balanced energy portfolio, but certainly not the sole solution because there are not enough hydro resources available to meet power demand. Another considerable user of water is thermal power, which includes the energy derived from nuclear reactions and fossil fuels. Thermal production drives the majority of U.S. energy needs. When water is not available, such as during droughts, energy production has to either be decreased or stopped completely. Some critics believe the thermal industry itself is not looking at options that could drastically reduce fresh water consumption. They point to transitioning to dry cooling, similar to a car radiator that uses air to power fans for cooling, or to a system that uses reclaimed or salt water in the wet cooling process. However, those in the business say those options are costly, would require major infrastructure changes and ultimately would cost consumers more. “It may be in the future that dry cooling is something that the industry can go towards; it’s not something that is utilized now in the industry because it is so new and hasn’t been proven and demonstrated,” said Caroline Choi, director of Energy Policy & Strategy at Progress Energy. Water is essential for two types of wet cooling techniques: Once-through and closed-cycle. In once-through cooling systems, an immense amount of water is withdrawn from a body of water, but 99 percent of the water is discharged back into the source after use. However, according to Choi many issues surround this process because discharged water is significantly warmer — and arguably dirtier — so it maims or kills aquatic life. To address these issues, EPA enforced a performance standard under section 316(b) of the Clean Water Act for new thermal plants that limits the thermal discharge impacts to those seen in closed cycle cooling plants, where significantly less water is withdrawn from the water source but 40 to 60 percent more water is consumed in the process. Closed-cycle systems, also known as closed-loop or cooling towers, withdraw water and continuously reuse it within the plant. A portion of water is evaporated in order to cool the remaining water, and another portion is discharged in order to remove contaminants left behind from the evaporated water. Zammit said several states have mandated or considered converting all plants, regardless of age and plant efficiency, to closed-cycle. Choi points out that the mandates of the Clean Water Act create a conflict in the balancing act between the environment around a plant and the water consumption of that facility. Closed-cyle requires more water to be consumed, but lessens the impact on plants and animals in the vicinity. Although plants built prior to the passage of the act are not required to upgrade to closed-cycle cooling, many energy companies have enacted measures at their older plants to protect wildlife. For example, Progress Energy has installed screens and fish-return systems — troughs and pipes that safely transport the fish caught in the intake back to water — as well as an aquaculture center that raises fish and releases them in an attempt to replace any that are killed. While companies have made or are considering plant modifications, the exponential growth in power demand resulted in an overall increase in water use by the electric power sector from 1950-1980. However, technological advancements introduced in the last 30 years have reversed the trend and shown a decline in total fresh water withdrawals by the industry. In response to demand growth, the U.S. Department of Energy and others are collaborating on a $40 million, 10-year research project to develop new technology options to reduce the demand on fresh water resources. The hope is that their findings will help mitigate the inevitable struggle to allocate enough water resources for energy production, especially with “new water demands from low-carbon generation sources such as nuclear, biomass and CO2 capture and storage,” said Dr. Bryan Hannegan, vice president of environment and generation at EPRI, in testimony about the need for such research before a House subcommittee in 2009. Zammit concurred. “There will be new technologies developed in the future that will help continue to reduce or eliminate the water impacts associated with power generation and use.” Yet, he added that water treatment methods — which also require water — will need to improve, thus forcing an ever-tighter relationship between energy and water. While the energy sector works to improve its water consumption efforts, conservation in individual consumption, though minimal in the water usage picture, can make some difference, experts agree. Keim also suggests xeriscaping, where home owners select native plants for their landscaping, which normally do not require any watering. People can make changes within the home, such as running the dishwasher only when it is full, taking shorter showers and turning off the water when brushing their teeth. Greg Feller, spokesman for the Orange Water and Sewer Authority in Chapel Hill, N.C., said that his utility continually encourages its customers to conserve water. Its public education efforts have paid off with a community-wide 25 percent water-usage reduction in the last 10 years. One point made to OWASA customers: Toilet flushing uses 30 percent of a household’s water. In most homes, one set of pipes brings clean water into and another set takes dirty water out of a home. In this system, all water is cleaned to the highest extent at the local water treatment plants. That process uses more energy than if consumers were to buy reclaimed water from their local waste water treatment plant for non-potable or non-drinkable uses. But a reclaimed system would require an extra set of pipes. While Feller said it is not economically feasible for his customers to install reclaimed water infrastructure in their homes, large companies are starting to integrate these systems. For example, buildings at The University of North Carolina at Chapel Hill recycle water for numerous non-potable uses, such as irrigation and toilet flushing. Reducing use of disposable products can also affect energy use because of the water drain through industrial processes. Some conservationists believe that the industry sector can greatly reduce its water usage by integrating reclaimed and salt water into its non-potable processes. According to the U.S. Geological Survey, less than 7 percent of the total water used in industrial production comes from salt water. However, industry officials note that their water usage is minimal compared to other sectors so strict water management is not necessary. Looking at the water footprint of individual products, though, paints a different picture. Producing one pair of blue jeans requires 3,950 gallons of water. In other words, producing one pair of jeans uses the equivalent of filling 55 regular-size bathtubs full of water. Refining one gallon of ethanol or gasoline requires just four gallons of water. But, before the ethanol is refined, the corn needed to produce the ethanol needs to grow, which requires another 2,500 gallons, or roughly 35 bathtubs. And manufacturing one quart of bottled water (mostly for the container) requires up to 2,000 times more energy than drawing a quart of tap water. Energy is also needed to clean up polluted water that consumers create when they dump contaminants, such as discarded prescription drugs, or that industry dirties when it discharges waste. In addition to conserving the quantity of water, Lynch says that it is important to conserve the quality of the water. “I think more than anything people need to understand what happens to the water when they flush the toilet, or when they pull the plug on the drain, or when they are washing their clothes and what they put in their laundry; they need to understand that the river starts there,” he said. As Americans continue to live a fast-paced, energy-hungry lifestyle, preserving the quality of available fresh water and reducing the quantity of water withdrawn to produce that energy on a daily basis will require more than just taking shorter showers or relying on technology and nature’s water cycle. One individual who has made the connection between water and energy use is Chris Carter of Saxapahaw, N.C. He used knowledge from his theater background building sets to construct both a windmill and solar panel array for his home. Now he manages to live on six to 10 KwH a day, or about one-third that of the average consumer. “I never invited the power grid onto my property,” Carter said. He has lived off the grid — meaning he does not have power supplied by a utility company — for the last 18 years by generating power from his windmill in winter and from solar panels in summer. Carter co-hosts a TV show about water quality issues; he is known as “Solar Jim.” However, because he has not owned a TV in 30 years, he has never watched his own show. Some observers believe that the balancing act will require major shifts in life styles and consumer habits, whether it is reducing personal use of water or the energy that depends on water. 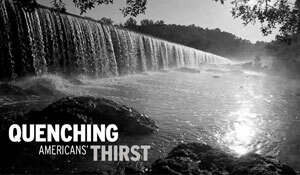 Lynch believes that society has undervalued the fresh water supply by pricing it far below its true value.